The Other End of the Corridor is a fiction book written by Sujata Rajpal. It deals primarily with domestic abuse and one woman’s journey through it. 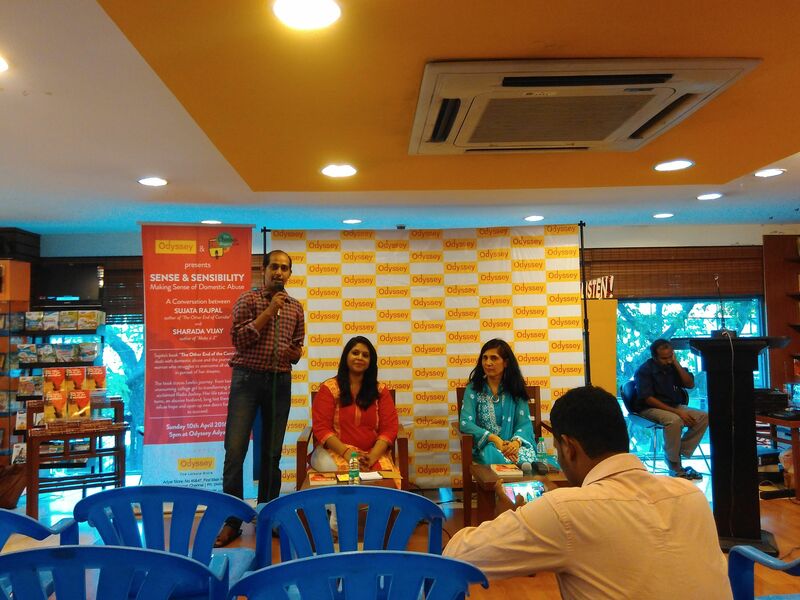 Our Chennai Bloggers Club organized the book launch event for this book, ‘Sense and Sensibility’, held at Odyssey book shop, Adyar, Chennai. The book launch was hosted by the author Sujata Rajpal and Sharada Vijay, author of ‘Make it 2’. In the photo you can also see Bragadeesh Prasanna, an upcoming author himself, and the Co-admin of Chennai Bloggers Club. There was a brief discussion about domestic abuse in Q&A format, between the two hosts. They spoke on various topics including what leads to domestic abuse and how people (women and men alike) can cope up with it. Then there was a Q&A session where both the panelists answered questions from the audience. “When your dreams are tainted with lies and deceit, you have no other choice but to walk to the other end of the corridor. She happens to meet two friends from a long forgotten past, which infuses hope and opens new avenues to realize her dormant aspirations. Leela delves into previously unexplored paths of deception and forbidden passions that only make her stronger.